The year 2013 may someday be known as "the year of the comets." If all goes well we may see two of the brightest comets in many years, and possibly one of the brightest in history. However, astronomers are being very cautious in their predictions because of past disappointments. As comet specialist David Levy says, "Comets are like cats; they have tails, and they do precisely what they want." Once thought of as harbingers of doom, comets are now known to be normal members of our solar system. They are small bodies similar to asteroids. The majority spend most of their lives in the Oort Cloud, a mysterious region on the outer edge of the solar system. Now and then they venture close to the sun, and undergo a strange transformation. The heat of the sun causes the comets' ice, which is their main component, to vaporize. The solar wind streaming off the sun forces this vapor into a huge tail, which flows away from the sun. No matter what direction they are actually traveling, comets' tails always point away from the sun. Bright comets appear only every few years, so it is very rare for two comets to appear in a single year. 2013 looks to be one of those special years. Traditionally, comets have been named for their discoverer or discoverers. In recent years, astronomers have adopted a system of naming comets that includes the year of their discovery, in this case "2011," followed by a letter and number indicating the point in the year in which they were discovered, in this case "L4." Many comets today are discovered by teams of observers, which has started a trend to name these discoveries for the project rather than the individual. This has two unfortunate results. It de-personalizes the discovery, and leads to a lot of comets sharing the same name. Peter Jedicke, past president of the Royal Astronomical Society of Canada, is urging astronomers to return to naming comets after people rather than acronyms. Comet C/2011 L4 is a case in point. 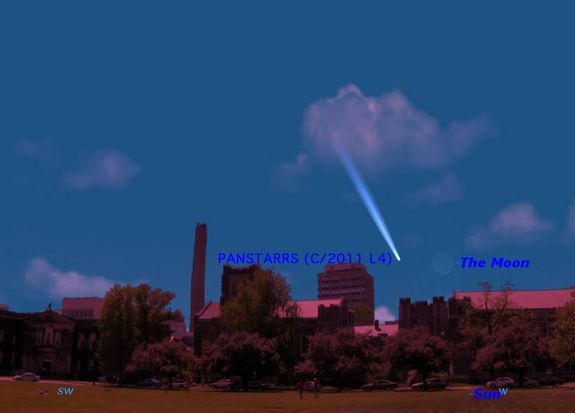 It was discovered by the Panoramic Survey Telescope and Rapid Response System, known by the acronym Pan-STARRS, and is one of three comets already discovered by this program. Jedicke would prefer that we call this Comet Wainscoat, after Richard Wainscoat, the member of the Pan-STARRS team who confirmed its existence. Comet Wainscoat (Pan-STARRS) as it may appear over the University of Toronto on the evening of March 12, two days after its closest approach to the sun. This comet will become visible to the naked eye for observers in the Southern Hemisphere in early February in the morning sky. It will be at its brightest on March 10, when it will pass close to the sun and move into the evening sky, becoming visible to observers in the Northern Hemisphere. Look for it just above and to the left of the setting sun. "Comet Wainscoat" will continue to be a bright object in the evening sky for the rest of March and the first two weeks in April. This comet was discovered on Sept. 21, 2012, through a telescope in Russia that is part of the International Scientific Optical Network, known as ISON. Its actual discoverers were two amateur astronomers, Vitali Nevski of Belarus and Artyom Novichonok of Russia. So Jedicke would prefer we call this Comet Nevski-Novichonok, because there are at least two comets named "ISON." This comet will make its first appearance to the naked eye of early risers in both hemispheres in the first week of November. It is what is known as a "sun grazer," a comet that passes very close to the sun. Its appointment with the sun will be on Nov. 28, when it will pass within 680,000 miles (1.1 million kilometers) of the surface of the sun, much closer than Mercury. If it survives this encounter, Comet C/2012 S1 should put on a spectacular show in the days immediately before and after that date. It is predicted to become brighter than the full moon, and to be visible in the daytime sky. The comet should continue to be a bright object for all of December and into early January 2014. But here we come back to David Levy's comparison of comets and cats. No one knows for sure exactly what will happen in late November, but all the world's astronomers will be watching the show, and hoping to see the brightest comet in decades. Editor's note: If you have an amazing of Comet ISON or any other night sky view that you'd like to share for a possible story or image gallery, send photos, comments and your name and location to managing editor Tariq Malik at spacephotos@space.com. Will Comet ISON be Comet of the Century?